WASHINGTON, D.C., April 20, 2017 — Javelin 19 Investments and Six Ten Properties announced today the acquisition of Nottingham South Apartments, an 85-unit, value-add multifamily investment near the Social Security Administration inside the I-695 and I-70 interchange in Baltimore. In addition to its convenient location inside the Baltimore beltway off I-70, Nottingham South is situated in the neighborhood of Hunting Ridge, a serene, mature and densely-populated submarket in Baltimore, Maryland comprised of well-maintained homes and gardens and an active community. The $4.25 million property consists of 33 studio units, 40 1BR/1BA units, and 12 2BR/1BA units and will be managed by Longford Management. “This acquisition is representative of our investment strategy of buying assets that are proximate to transportation corridors, retail amenities and employment centers, and that offer the ability to increase NOI through revenue enhancement programs and prudent expense management. We are actively pursuing other 30 to 100 unit multifamily core-plus and value add acquisitions in the Baltimore-Washington markets,” Six Ten Principal Martin Ditto stated. Javelin 19 Investments, Ditto Residential, and Longford Management have formed a partnership to acquire, operate and manage core-plus and value-add multifamily assets in the Baltimore-Washington Metropolitan area. The team has extensive multifamily experience in developing and acquiring apartment communities, financing and capital markets, design and renovations, as well as property management. Collectively, the team has participated in the acquisition and development of more than 100 properties, with total capitalization exceeding $1 billion. Javelin 19 is a metro-Washington, DC based development and investment firm with approximately $140 million in residential projects and transactions since its founding in 2011. Six Ten Properties is a partnership between Ditto Residential and Longford Property Management. Ditto Residential is the premier luxury for-sale and for-rent property development company in Washington, DC. Since 2008, Ditto has completed over 60 projects and has a current active development pipeline of $145 million. 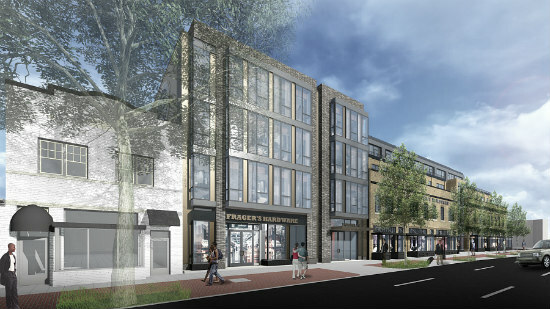 Longford Property Management is a D.C.-based property and construction management and development company that manages more than 350 residential units and in excess of 200,000 square feet of commercial/office space across 75 buildings in the District of Columbia, Baltimore, and northern Virginia. Javelin 19 Investments has teamed with Perseus Realty for the development of approximately 40 condominium units with ground floor retail, including the return of Frager’s Harware to its original location. Hickok Cole is serving as the architect on the project which includes mainly larger two- and three-bedroom residences and approximately 35 underground parking spaces. The team closed on the site in 2015. The project is currently in the design phase. WASHINGTON, D.C., March 27, 2013 — Javelin 19 Investments and EdR (NYSE:EDR), a leader in the ownership, development and management of collegiate housing, announced today that they will co-develop a $46.1 million collegiate housing community at Duke University in Durham, N.C., through a joint venture structure. Javelin 19 of Washington, D.C. will be co-developer and 10% owner. EdR of Memphis, TN, as the 90% owner and managing member of the joint venture, will provide development, construction oversight and management services for the 386-bed community, which is scheduled for a summer 2014 completion. The community is designed to appeal to graduate students and upperclassmen whose housing needs are not met on the Duke University campus. Graduate students constitute more than half of the total 2012 enrollment of 14,591 students. The new community will be within walking distance of recently leased university office and research space where graduate students will be employed or studying. The location is also pedestrian to Durham’s downtown entertainment district, the Durham Bulls baseball park and the recently completed city transportation hub. The occupancy rate for apartments in the Durham sub-market is in the high 90s. The urban-style, mid-rise development will offer studios, one-bedroom and two-bedroom apartments along with upscale amenities — lounge, coffee bar, fitness center, yoga area, cable, Wi-Fi and internet access, outdoor grilling area and swimming pool. An attached garage will provide nearly 400 parking spaces for residents. Completing the team with EdR and Javelin 19 are lead architect JDavis Architects of Raleigh, N.C., civil engineer John R. McAdams of Durham, N.C. and Clancy & Theys Construction Co. of Wilmington, N.C.
Washington, D.C.-based Javelin 19 invests in and develops multi-family and commercial real estate in the mid-Atlantic region. Founded by Duke alumna Jill Homan and Kevin Hill, Javelin 19 targets acquisitions and developments in the $5M to $50M range. The company principals pursue both on- and off-market opportunities using their extensive industry network and partner with experienced management companies and equity investors. For details, please visit the company's Web site at www.javelin19.com. EdR (NYSE:EDR) is one of America's largest owners, developers and managers of collegiate housing. EdR is a self-administered and self-managed real estate investment trust that owns or manages 67 communities in 24 states with more than 37,000 beds. For details, please visit the company's Web site at www.EdRtrust.com. All Content Copyright 2019 Javelin 19 Investments, LLC. All Rights Reserved.